This Day You Were Born Newspaper makes for one of the most sentimental gifts ever! This authentic, well-preserved edition of an original newspaper is not a reproduction (or just the front page) but the actual edition. Find out what news stories occurred and see how much cheaper prices were in some of our old newspapers! We have preserved old newspapers going back to the 1800s. You will receive a prominent national newspaper (we'll choose the paper for you). A truly thoughtful one-of-a-kind gift! Sunday papers include main section only. Please Note: Historic dates priced higher. Availability: This item takes approximately 7-8 business days to leave the warehouse plus ship time. Disclaimer: On rare occasions, there may be a slight delay of approximately 3-4 additional business days to process your order if your newspaper is out of stock in our main facility. CLEAR VINYL PRESENTATION: The clear vinyl includes the newspaper and the certificate of authenticity in a clear vinyl case. ORIGINAL PAPER IN GIFT BOX: Includes the newspaper and the certificate of authenticity in an elegant dark green, textured-finish presentation box. 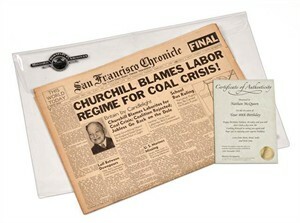 PERSONALIZED DELUXE: Add the ultimate touch by displaying your commemorative newspaper in an elegant presentation case. The handsome 'hand-finished' deluxe case comes with the words "A Day To Remember" embossed in gold. The Certificate of Authenticity appears prominently when the case is open and shows that your newspaper is the original, complete edition. PERSONALIZED PREMIERE PRESENTATION: Set your unique original newspaper in a hand-made leatherette gift binder, with parchment fleur-de-lis endpapers and gold embossed with the recipient's name, title and date of the original newspaper. As with all Historic Newspapers, the "Premiere Book Presentation" comes with its own Certificate of Authenticity verifying the unique value of this prestigious gift. NOTE: Due to its unique nature, this Day You Were Born Newspaper may not be returned. The Certificate of Authenticity sent with this item is NOT Personalized as pictured. This Day You Were Born Newspaper is a truly unique keepsake that makes a memorable birthday gift! If you're looking for a gift for a special occasion than buy this birthday newspaper so they can relive all the events that happened on the day they were born. It will be interesting to see how low prices were and to look at advertisements before cultural changes were made by history. We have thousands of old newspapers in near mint condition. This keepsake makes a truly unique birthday gift.